The retail industry is going mobile in a big way. But mobile commerce is still in its infancy compared to big media and entertainment companies who have been playing with mobile experiences for years. By learning from these industries, retailers can get a head start on designing effective mobile commerce strategies. 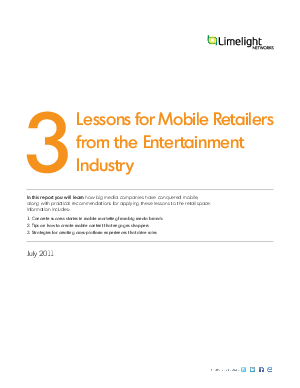 3 Lessons for Mobile Retailers from the Entertainment Industry will show you how to put those strategies into action. Download this paper now to learn how to use mobile to generate the highest consumer engagement and conversion rates.